Yesterday’s talk on WebKit/Gtk+ at LinuxConf Europe was well received, and I was particularly impressed by the turnout considering that it was scheduled against Linus’ git BOF next door. The audience had more questions than there was time for, but those that I was able to answer were split mostly between questions about mobile performance/footprint and standards compliance. The talk covers some of the history of both the WebKit browser engine and the WebKit/Gtk+ port, looks at the ethos of the developer community and explores current and planned features, such as SVG, Canvas and audio/video. It goes into detail about work involving the Nokia N800 internet tablet and Maemo as well as a brief look at integration work being done by the OpenMoko project, the state of play with OLPC and, of course, GNOME’s Epiphany web browser and Devhelp documentation browser. Great presentation. You guys are doing awesome work. It’s great to see all the competition/innovation happening in the browser space. This should put a lot of pressure on Mozilla to improve the embedded story for Gecko. 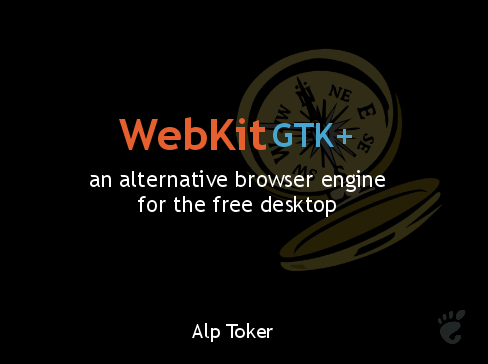 It was a shame I missed this, I’m really interested in the possibilities of webkit. Any chance of slides or a video? Just read your slides, absolutely brilliant 🙂 Looks like WebKit is poised to take over the planet. The KHTML developers should be really proud. Everyone saying Konqueror is not a real browser and now KHTML, in the name of WebKit, seems to be everywhere. Also, for KDE4, KDE itself will use WebKit, that is, you could say “Apple and KDE joined forces to avoid patches going back and forth”. It’s nice to see on the Gnome side WebKit taking off. No decision has been made at all in KDE to make WebKit/Qt an integral part of KDE 4.